7 The king was enraged and sent his troops, destroyed those murderers, and burned their city. 8 Then he said to his servants, ‘The feast is ready, but those who were invited were not worthy to come. 9 Go out, therefore, into the main roads and invite to the feast whomever you find.’ 10 The servants went out into the streets and gathered all they found, bad and good alike, and the hall was filled with guests. The King Responds. Patience goes so far. Upon hearing that the servants have been, in some cases, murdered, the king responds. While the feast continues to wait, the king wages war (v.7). Those who had dishonored and rebelled against him were put to the sword while their cities burned. The vocabulary reflects Matthew’s theology: “destroyed” (apollymi) is the same verb used in 21:41; “murderers” reflects the same view as 23:31, 35. Matthew is thinking in terms of his view of salvation history, not of an actual king who waged war while dinner waited. Most scholars see this as Matthew’s retrospective view of the destruction of Jerusalem, understood as a judgment on rebellious Israel, who had rejected the Messiah. The rebellious first group has been judged as unworthy (v.8), but the feast is still a celebration awaiting guests. The Main Road. “Go out, therefore….” and so a third group of servants is sent onto the “main road” (diexodos hodos) – a reasonable translation, but then again, something is lost. The term diexodos describes the road that leaves the city crossing over into the countryside. In the allegorical setting, this would mean to leave Jerusalem and the center of Judaism, going out to the land of the Gentiles as well as Jews considering not worthy of the Covenant. The language used here shares vocabulary with the Great Commission of 28:12-20. The invitation is no longer restricted to those who had accepted the previous invitation, but is extended to all. Those who are “gathered in” are both bad and good, corresponding to Matthew’s realistic picture of the church known to him (see 13:24–30 and 13:47–50). The Community Gathered. 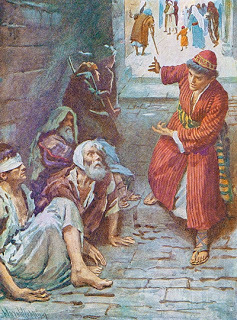 This parable further clarifies not only the failure of the leaders and its consequence, but also the nature of the new “nation.” They are symbolized now by an indiscriminate collection of people from the streets, people of no special standing, just as in 21:31 it is the lowest social groups who will get first into the kingdom of God. This feature of the story speaks of the universal proclamation of the good news of the kingdom of heaven. The concept of a mixed community, within which not all will make it through to ultimate salvation, has been a recurrent feature of this gospel. Consider Matthew 7:13–27, especially the “impostors” of 7:21–23 who apparently thought they were all right, and later in Matthew’s gospel (25:1–13) where both wise and foolish bridesmaids are invited but only the wise get into the feast. Remember also Mt 13:36–43, where weeds and wheat are allowed to grow together and are separated only at the final judgment; also 13:47–50, in which good and worthless fish are gathered in the same net. Matthew 22:9 main roads: the term diexodos is sometimes taken to mean cross-roads or street crossing. In many cases it describes where the main road crosses the city boundaries into the open countryside. Matthew 22:10 bad and good alike: cf. Mt 13:47 – nets cast catching fish good and bad. This entry was posted in Scripture and tagged great wedding feast, Matthew 22:1-14 by Friar Musings. Bookmark the permalink.